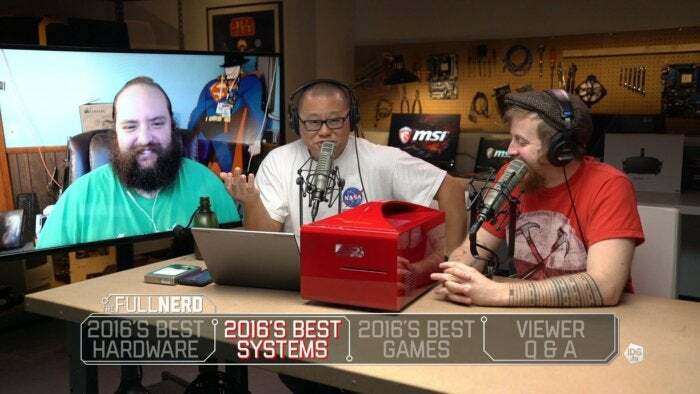 This week on The Full Nerd, Gordon Mah Ung, Brad Chacos, Hayden Dingman, and Adam Patrick Murray debate the best PC hardware and games of the year. 10-core Intel chips or AMD’s new generation of APUs? The Radeon RX 480 or Nvidia’s beastly GTX 10-series graphics cards? Battlefield 1 or Forza Horizon 3? The gang chimes in on all that and more. Spoiler: Some of the picks are so close that we needed to turn to the Facebook Live audience, as a tie-breaker—which helps to highlight that these picks are just the favorites of the Full Nerd cast, not official PCWorld awards. Subscribe to PCWorld's Facebook page and you'll be notified when we go on-air, giving you the chance to make your mark on the show when we film it live every other week. Watch the Full Nerd Episode 12 on YouTube right here, or by just clicking the play button below. Now that we’ve looked at the best gear of the year, the Full Nerd crew will gaze forward in episode 13 with bold PC predictions for 2017. Be sure to tune in next week! Have a question about PC hardware? Email thefullnerd@pcworld.com and we’ll try to answer it in the next episode. To find previous episodes of The Full Nerd, go here or visit our SoundCloud page for the audio edition. And once again, you can always send us feedback about anything you hear on the show.